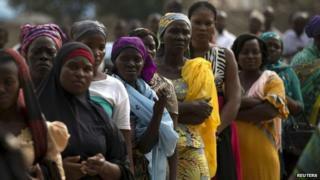 Nigerians are going to the polls to vote for state governors in the final round of the election process. Elections for 29 governors and all 36 state assemblies are taking place. Some of Nigeria's governors control huge budgets and are among the country's most influential politicians. The vote comes two weeks after Muhammadu Buhari defeated incumbent President Goodluck Jonathan to become the country's first opposition candidate to win a presidential poll. Gen Buhari won by more than 2.5 million votes. Polling stations opened at 08:00 local time (07:00 GMT). While presidential polls two weeks ago encountered some problems with the electronic card reader, the process this time appears to be taking place without any hitches, reports BBC Hausa's Mansur Liman. In many of the states, Saturday's gubernatorial and state assembly elections could prove to be a tight race between Mr Jonathan's People's Democratic Party (PDP) and Gen Buhari's All Progressives Congress (APC). The key battlegrounds include commercial hub Lagos, and the oil-rich Rivers state. Tensions are reported to be especially high in Rivers. The AFP news agency reports that an overnight curfew was imposed on the eve of the election to prevent any violence. The Independent National Electoral Commission (Inec) spokeswoman for Rivers state, Tonia Nwobi, told AFP that they were working with security agents to ensure a "hitch-free election". Results are not due until Sunday. Biometric voting cards are to be used again, despite some problems with their debut in last month's election. Technical problems slowed down voter registration, even affecting President Jonathan. But Abubakar Momoh from Inec told Reuters that the new system was crucial. "The card reader is the only way that rigging on a large scale can be stopped in this country," he said. Observers have generally praised the recent presidential election, though there have been allegations of fraud even with the use of biometric voting cards.